13 ounce vinyl fabric is most commonly used for industrial applications. This flame-retardant, OSHA approved medium weight fabric is easy to handle. Wipes clean. 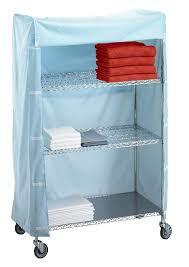 Did you know Latest Products Corporation is one of the nation’s largest suppliers of cart covers and shelving covers? All of our covers are custom designed to your specifications. We use reinforced corners on all covers to withstand wear and tear, and utilize either reinforced Velcro or heavy duty zippers to provide a more secure closure.